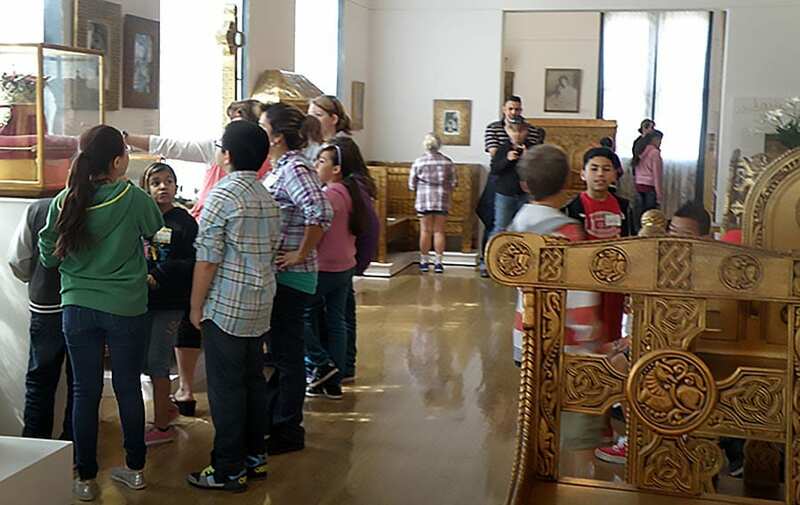 Maryhill Museum of Art is pleased to offer special admission prices for K-12 groups; groups may choose to take self-guided tours or a new thematic, discovery-based tour. K-12 school groups and home-school groups may choose the “DISCOVER Maryhill” tour that engages students and new museum visitors with active-looking and facilitated dialogues that support state learning standards for Washington and Oregon schools. These tour experiences are 30 to 60 minutes, depending on the age of the students. This gives groups time to use their newly acquired discovery skills for continued engagement as they explore the museum with their chaperones. Educators may instead choose a tour theme to connect to an area of study in the classroom. Tours may focus on language arts, social studies, history, art-making, art history or any number of subjects. To choose a more specific theme, please contact the Curator of Education at 509.773.3733 ext. 25. We are happy to support your classroom teaching. Explore fashion from Native peoples, European royalty, post-World War II France and other collections at Maryhill to discover the messages clothing sends about the culture from which it originates. Look closely at a work of art to discover the stories objects can tell us. Using poetry, create meaning and connections between the visual and language arts. Looking at works of art to learn about the culture in which it was important. Look closely to discover the techniques artists use to make art, as well as the details that engage the viewer. Student admission is $2 per student for self-guided experiences. Student admission plus a facilitated tour is $3 per student. All teachers and one chaperone for every 10 students are free. Additional adults are $3 per person. Payment is made at the admission desk upon arrival. Checks, credit cards or purchase orders are acceptable. To make a reservation, please email education@maryhillmuseum.org with your requested date, arrival time, number of students and grade level, or call 509.773-3733 ext. 25. Please have alternate dates available as tour spaces are limited. School group tours for those with accessibility challenges are available by request by contacting the Curator of Education either by phone at 509 773-3733 ext. 25 or via email at education@maryhillmuseum.org. Parking is free; there is also ample free parking available for buses. All exhibit areas and restrooms in the museum are handicapped accessible. Picnic grounds are located east of the museum building. Click here for a map and directions to Maryhill Museum of Art. Each spring and fall, Maryhill presents special half-day programs targeted specifically to third and fourth-grade students. For more information, click here. Download free classroom lesson plans here.